Circles.Life has apologised and pulled down its latest billboard featuring local actress Eunice Olsen. In an Instagram post Olsen said she felt uncomfortable over the telco’s latest Epic Invite billboard campaign, and has since filed a police report. “Advertising can play a big role to influence gender equality. As a brand, ad agency, media buyer, or media owner, you have the power through your ads to empower women, or disempower them. We are influenced by what we see in advertising whether we like it or not. By having ads like that, you are sending the wrong message and reinforcing stereotypes about women,” she added. Marketing has reached out to Olsen for a comment. Circles.Life said in a statement to Marketing that it “never intended” to make Olsen feel uncomfortable and it apologises for that. The spokesperson added that the submission was made by an individual with the social media handle @alexkrygsman. “We are taking down the ad immediately. We will learn from this experience and appreciate the feedback,” the spokesperson said. Hi everyone, do any of you know what ad this is at Raffles place? A dear friend of mine alerted me this morning. She was rushing and did not manage to see where the ad is from. My manager and I do not know anything about this ad and the company did not seek permission to use my name. Just wanted to let all of you know that I am not part of this company’s ad campaign. This ad is sexist and derogatory towards women, and using someone’s name without permission. 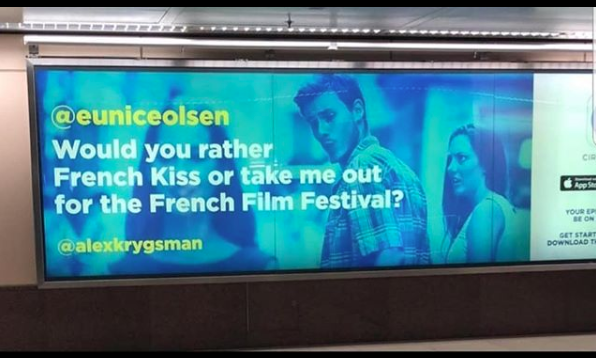 Companies should not get away with putting up ads like these. . Iceland has legislation against sexist advertising that makes women feel disempowered and I think it’s about time Singapore has this too. In a similar marketing stunt, the telco recently placed an invite on a billboard along Raffles Place asking Crazy Rich Asians’ star Henry Golding out on a date for The Weeknd concert. This was in a bid to promote its new feature named Discover, which allows customers to explore events happening around the city, personalised on their interests. With almost two micro-film releases per year starting 2012, Cartier ups its micro-film investments in the luxury category with a n..